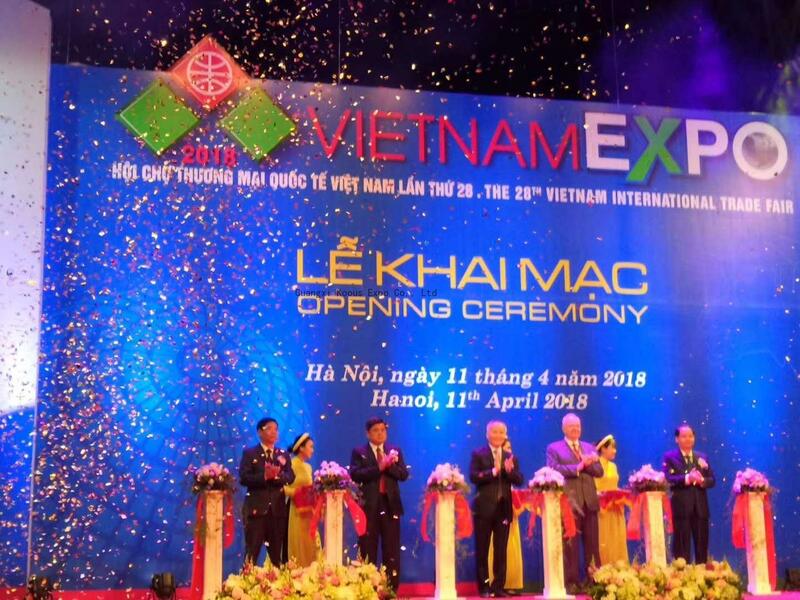 Vietnam International Exhibition on Machineries & Technologies of Agriculture, Forestry, Fishery 2017 (GROWTECH 2017) is jointly organized by National Agency for Technlogy Entrepreneurship and Commercialization Development (NATEC) and Adpex Joint Stock Company under the chairmanship of Ministry of Science and Technology, Ministry of Industry and Trade, and Ministry of Agriculture and Rural Development. The exhibition has taken place in 3 days from Nov 30th to Dec 2nd, 2017 at the Hanoi International Exhibition Center, 91 Tran Hung Dao St, Hoan Kiem Dist., Hanoi. 2017 is the first year that marks the opening of the GROWTECH VIETNAM EXHIBITION. During the 30 years of renewal, Vietnam's agriculture has achieved a rapid and stable growth over a long period of time. In the next time, the agriculture - forestry - fishery industry in Vietnam is oriented to increase its added value with a sustainable development; apply scientific and technical achievements to improve capacity, productivity, quality; promote commodity production moving towards the modern market economy; increase its competitiveness and maintain its rapid development efficiently and safely to become one of the key leaders of national export. GROWTECH VIETNAM 2017 has attracted the participation of 100 enterprises with more than 200 booths coming from about 20 countries and territories. The Expo is a gathering place for diversified product lines and technologies: Agricultural construction machinery system, Equipment and technology for cultivation, Greenhouse technology, Machines and equipment for the production of chemicals and fertilizers, Animal care equipment, Machines and equipment for the production of animal food, Technology and equipment for postharvest preservation... The Exhibition provides organizations, individuals, industrial and rural agriculture establishments of a direct access to technologies and products of enterprises manufaturing machinery and equipment in the agriculture-forestry-fishery processing industry such as: Cultivation technology from UK; Greenhouse technology and Irrigation system from Israel; Technology of breeding systems from the Czech Republic; Water and soil treatment technology from Indonesia; Postharvest preservation technology from Taiwan; Wood gasification system from Germany and hundreds of agricultural technology products from Italy, Japan, Korea, Netherlands, Newzealand, India, China and Thailand. GROWTECH 2017 promises to create an environment for exchanges of learning, joint venture and cooperation in scientific and technological activities with international partners to help Vietnamese specialists, Vietnam Farmer’s Union and agricultural enterprises access to high technology and science applied to agriculture to bring the highest efficiency. “In addition to Vietnam’s study findings and technological products, UK’s cultivation technology; Germany’s Wood gasification system; Greenhouse technology, irrigation systemsg Israel; Technology of breeding systems from the Czech Republic; water and soil treatment technology from Indonesia; Postharvest technology from Taiwan and hundreds of agricultural and food technology products from Italy, Japan, Korea, India, China, etc. will be displayed in throughout the exhibition”. Mr. Pham Duc Nghiem added. Vietnam agriculture is significantly developing with the participation of private enterprises and starts-up with high quality products meeting market demands and offering added values for agricultural products and supporting services. To encourage and accelerate these enterprises and perform its role of supporting entrepreneurship ecosystem, National Agency for Technology Entrepreneurship and Commercialization Development (NATECH) is providing participating fee for individuals, organizations, and businesses owning patents of products, technologies and technological applications in agriculture field. Moreover, at the exhibition, the PMU of Vietnam Climate Innovation Center (VCIC) is providing linkage and financial access to various funds, especially World Bank, for ideas and applicable products for smart agriculture sector. The total amount of funding would be up to USD75,000. Apart from giving a chance for participants to connect and exchange information with domestic and international partners, GROWTECH 2017 includes an array of informative and useful conferences and workshops for all attendants. Known as the start-up nation, Israel is considered as a typical example of uniform development of various ears whose success mainly based on technology. In the workshop in afternoon 30 November, participants would have a chance to understand the overview of this country’s technology revolution in irrigation, greenhouse system, cultivation, and animal husbandry shared by Israel Embassy’s delegates. Following seminars on forestry and transformation in the era of 4,0 hosted by Vietnam Forestry Department is taking place in afternoon November 30. The seminar “The latest agricultural technology commercialization in Vietnam” is hosted by NATEC on December 1. The exhibition also consists of the seminar “To develop the processing and preservation of agro products” hosted by Agro Trade (Ministry of Agriculture and Rural Development) in afternoon December 1. These seminars allow people, management units, researchers, and enterprises in agriculture-forestry-fishery fields to figure out optimal solutions in production and business processes. GROWTECH 2017 not only brings opportunities for specialists and enterprises to exchange information and acquire knowledge but create the bridge enabling farmers to deeply access to high-tech products in the era 4.0 when agriculture – forestry- fishery is developing dramatically. For the first time in Vietnam, farmers, fishers and workers in the forestry sector will be able to participate in an international exhibition that is full of all the latest technology and activities in all 3 fields of agriculture - forestry - fishery. Aiming at establishing and developing a high-tech market, GROWTECH VIETNAM is expected to be a great international exhibition on agriculture, forestry, fishery and a direct technology exchange floor, bringing the core values for sustainable agriculture, creating real value for producing high quality agricultural products for domestic and international markets.